This beautiful 9-8 Nova just completed the journey from Ventura, CA to Charleston, SC via Amtrak. Packing and shipping added only $150 to the final cost. Board arrived completely unscathed. Finished in light-blue resin tint and with tight 2″ cut-lap by Lucke Glassing, no need for pinlines. This board was identical to the 9-8 “Green Wedgie” Nova but sports a single, 5/16″ cedar stringer instead of the wedge. Cedar is a great choice for light tint boards. It offers a striking but elegant appearance. 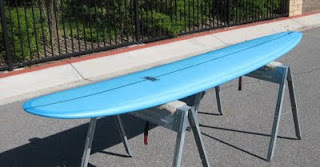 Fins included a 9.5″ True Ames California Special (shown) for smaller days, and a 2+1 combo with a 7.5″ TA L-Flex center fin and TA side-bites for those occasional East Coast hurricane swells.